available 4-speed Hydra-Matic transmission, new options and accessories. 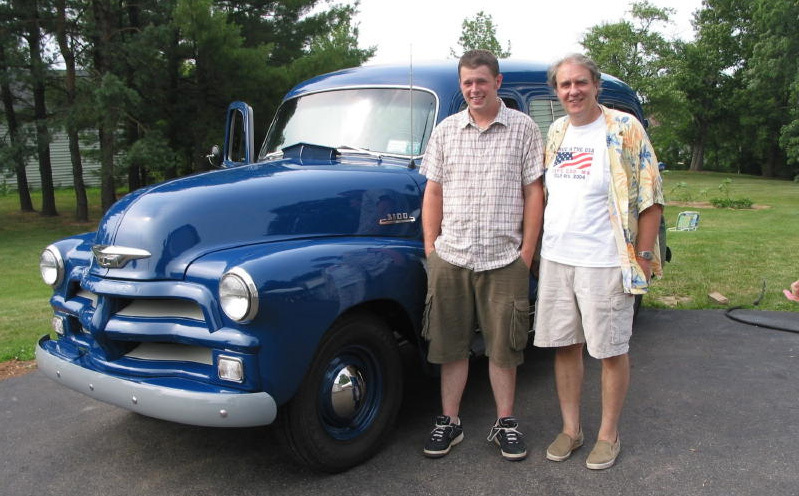 Why 1954 Chevrolet Advance-Design Trucks ? 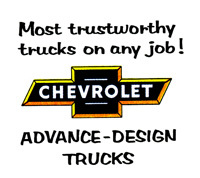 This web site is a chronicle of the history, events, and activities related to my interests-in and ownership-of Chevrolet Advance-Design Trucks (the Post-WWII series of trucks, sold by Chevrolet from late-1947 through early-1955). 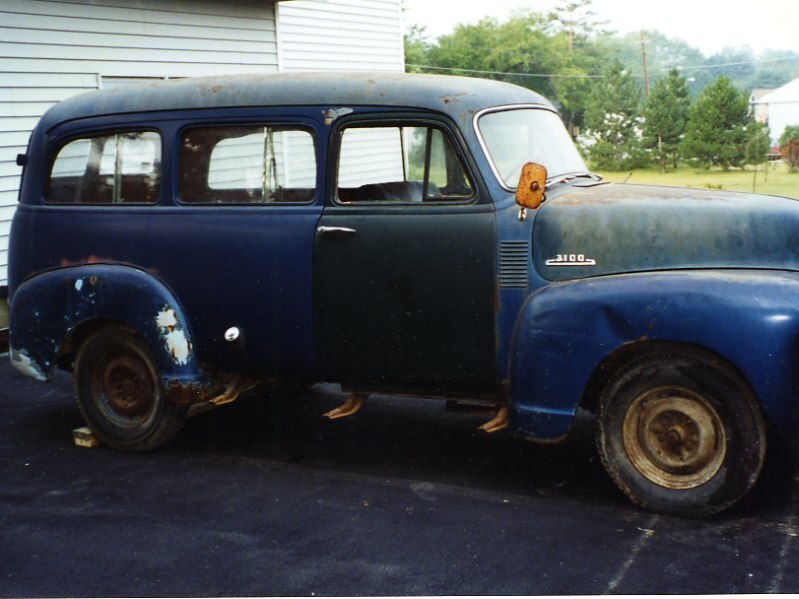 The first vehicle I ever purchased, in 1969, was a 1948 Chevrolet 1/2 ton Panel Truck that cost $70. This model 3100 (1/2 ton) Panel Truck was rusting away due to moisture in the red clay that was caked inside and underneath every part of the body. The engine started, all the lights and gauges worked, and the brakes seemed safe. After visiting several local salvage yards (Harry A Wright's Inc. and Leon's were the best), the panel became a truck of many colors (with a sign on the white driver's door that stated "Max Food Snacks - Coast to Coast"). In the summer, it was legal to drive with no door (see photo) – this provided air-conditioning and it also allowed the truck to pass inspection (the broken window in the door would have failed it. The Panel Truck was our only vehicle. 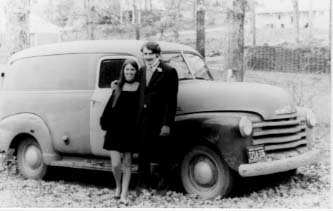 We drove it away from our wedding reception in 1970 and drove it to my brother's wedding reception (see photo). We were students and happy members of the '60s counter-culture. The engine threw a rod in early 1970 – the panel was on-loan to my younger brother, who might not have heeded my warning to let it warm up a little and to drive easy. Having little money to spend on vehicle repairs, and having no knowledge of anything related to motor vehicles, and being dedicated to self-sufficiency, I naively visited the Alderman Library at the University of Virginia (I was a second year student in '69-'70) and, oddly enough, checked out a 1948 Chevrolet Truck Shop Manual (the only Shop Manual in the Library). With that Shop Manual, and a new $69.99 (on sale) Sear's Craftsman tool kit, I undertook to rebuild the engine. That started not just my education in mechanical repairs of Chevrolet Advance-Design vehicles but also it laid the foundation of my respect for these well-built, practical, reliable, and easy to maintain trucks. In late 1971, my brother-in-law, Bobby, mentioned that he had seen a small Chevrolet "bus" in a farmer's field near Crewe, VA (it was being used for moving-target practice). 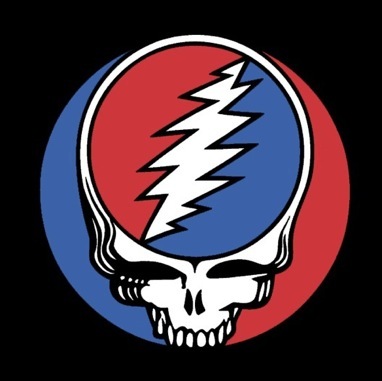 We purchased that 1954 Chevrolet 1/2 ton Suburban Carryall for $200 and a week later we were traveling with three friends to a Grateful Dead concert in Atlanta GA. When we returned I decided it was time to check out the truck. One spring-shackle was completely broken and there was no button on the top of the rotor in the distributor (the points and metal inside the distributor cap were seriously pitted). After a full tune up, and a complete rebuilt of all the spring pivot points, and a complete overhaul of the brake system, the Suburban ran real well for another year. In late 1972, the low oil pressure and low compression of the old 235 engine was so bad that we could hardly make it up Afton Mountain in first gear (for a sunrise meditation). So, it was off to Leon's Auto Parts (junk yard) to see about a "new" engine. I think Leon was a little entertained by seeing a long-haired, mechanically un-knowledgeable, and totally fearless person asking about what used engines were available. Leon said he had several old automobile 235s that would do the job (at $200 a pop). However, he also said he had an engine in a 1960 school bus that had been well maintained and was fresh from a recent auction - I could have it for $100. Even back then, that was a good price for a running 261 big-truck 6-cylinder engine. I bought the engine, took it apart and found it to be full of clean oil and clean coolant. Nonetheless, even though I had just started in a graduate program, I wanted/needed dependable (and cheap) transportation. So, I undertook to rebuild the 261. What an improvement - more power, more torque, easy starting - this made the Suburban an enjoyable, but quite ugly, ride. After rebuilding a 216 (by myself) and the 261 engine (with Bill Keene, Rodney Shifflette, and many of my brother-in-law's stockcar-racing friends), and doing repairs on brake and electrical systems, I had enough knowledge to keep the old Suburban running for us and also to keep the older Panel Truck running for the Madison Hall community service organization at UVa until we moved to Scotland in 1975. 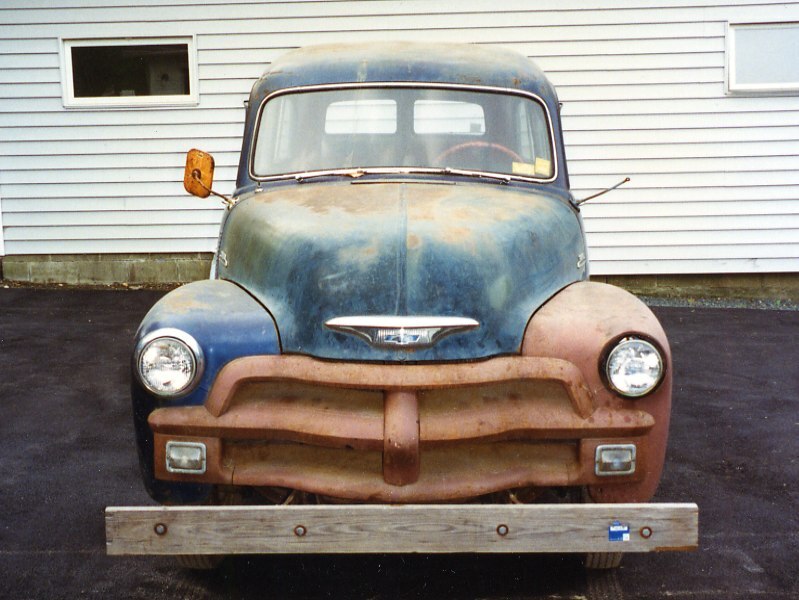 My early education in these trucks lasted until 1975, when we put the 1954 Suburban into storage at Rick Brandt's barn in Flat Rock, near Crozet, VA, because we were moving to Scotland for three and a half years. When we returned to Virginia in late 1978, we had a child and soon had jobs that took us to Albany, NY. In 1980, I returned (with Ken Jones who was visiting us from Scotland) to Bill Keene's house in VA - it was time to drive the Suburban to NY. After checking out the brake system and charging the old battery, the truck started right up. The 500 mile trip to NY was uneventful (except for Ken finding a 5 foot long snakeskin in the ceiling). Due to lack of time and money, the Suburban sat in our dirt-floor garage in NY (and rusted and rotted) until 1994.
. . . the long middle . . . Suburban Restoration: For a variety of reasons, I decided in 1994 that it was time to do something with the Suburban (my old, neglected "friend"). My son, Aidan, did not see any potential in the project but some of his friends saw visions of a "Grave Digger" coming to life. 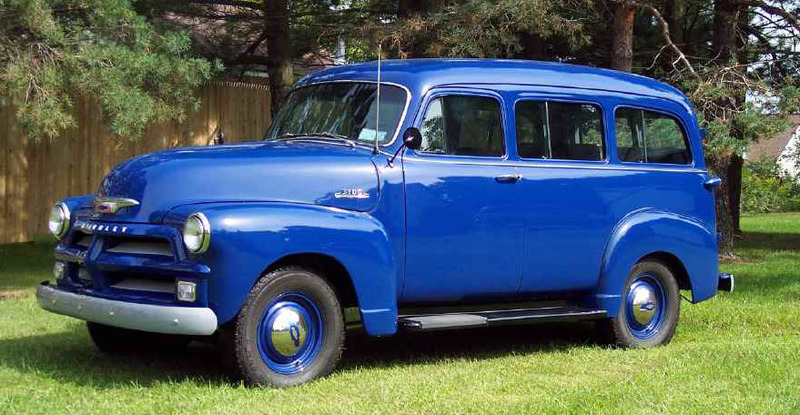 In 1995, the restoration of the 1954 Suburban began in earnest - disassembly began (as did my familiarity with the growing number of suppliers who carried used and reproduction parts for these vehicles). I told Lela, my daughter, that she would be able to drive the Suburban by her senior year in high school (1999-2000); but, I was a little off because the Suburban was not ready for passengers until July 2004. A lot of rusted metal had to be replaced - this was masterfully done by Des D., an accomplished fabricator, panel beater, welder, restorer, and and real nice fellow (some of Des's work in in an album on the right). Dave Cavagnaro (above, left), a friend and neighbor, did all the finish body-work and painting (I was his go-fer). Dave and I (and many friends) reassembled the truck in time for it's 50th Birthday Party (see photo albums on the right) on 4 July 2004. If You've Got Time . . .